Advanced Machinery in Spotlight Again Thanks to Next Generation MetalWise CNC Plasma Cutting Machine. Advanced Machinery located in Johannesburg has been focusing on developing CNC technology and sales on CNC Machinery for several years. They would now like to introduce the second generation Plasma Cutting Machine to the market. On Wednesday 11th March 2015 Advanced Machinery hosted a demonstration to show off their MetalWise CNC Plasma Cutting Machine in Jet Park. 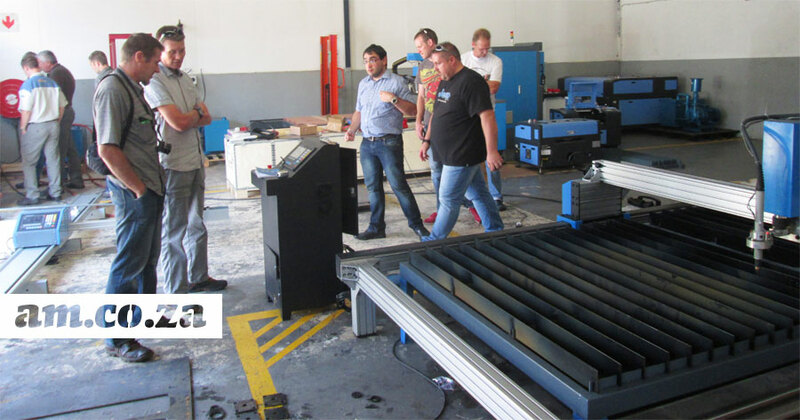 More than 20 amused clients were standing around the MetalWise CNC Plasma Cutting Machine as they carefully watched as all kinds of shapes including the AM.CO.ZA Logo was being cut out of 6mm mild steel by the standard version of MetalWise CNC Plasma Cutter with Hypertherm Powermax 65A unit. You can come view this extraordinary technology among others in action at our DIY workshop in Jet Park. Since the inception in 2012, Advanced Machinery has grown profusely – from its meagre beginnings as purely a CNC machine selling agent, to an organisation that stands tall and offers comprehensive CNC machine related services. Not only do they design, engineer and supply state-of-the-art machinery, but they also source reputable suppliers from China and coordinate the entire import process in a manner that minimises the risk for them clients and places the onus on them to demonstrate our commitment to delivering the superior quality solutions that they have become renowned for. Please visit http://am.co.za/about or call 072 222 2211 for more. AM.CO.ZA Group of Companies is current consist of several companies in various of sectors. All of them reflect the founder’s strong sentiment that Achievement Matters. Whether referring to achievement in business, marketing, training or simply in a personal capacity, am.co.za and all of its subsidiaries are geared specifically toward helping our customers realise the potential and achieve…… For a list of the companies and the business sector they falls in, please visit http://am.co.za/ for more. Another copy of this press release with more photos can be found on the Advanced Machinery Website.